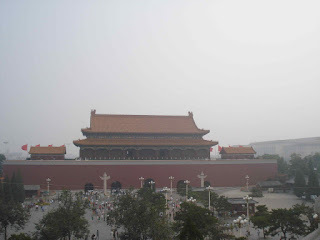 So I decided to check out Tian'anmen Square. My travel buddy wanted to sleep in a little. I wait until about 1:30 in the afternoon to call him, and his response......"I am going to lay around and be lazy." Well, thats great, now it is late afternoon and I am heading to the sites alone. But I run into another buddy and off we go. We walk around in the hot sun checking out the preparations for the arrival of the olympic crowds. The square is under construction and it looks like when it will be finished it will look really cool. All the local chinese wanted their picture taken with the Aussie. Which is odd, because I am not from Australia. I may have mislead them a little . 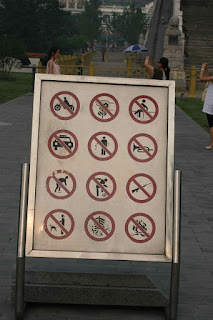 Below you will see a sign of all the things you can't bring to the square. I say, what fun is it without a motorcycle and an assault rifle? I think your blog is a very good.